Generates FilterBankEvents indexed color images based on a color threshold file. Pretty simple idea - use a big mapping of YUV values to lookup index values. The color information is shared for all threshold files in this object. The row skip is always 0, and the row stride is always width. But it would be better to use the proper accessor functions to be more general. Should receive FilterBankEvents from any standard format FilterBankGenerator (like RawCameraGenerator) However, images that use an increment!=1 will break. The events which are produced are SegmentedColorFilterBankEvents, which will allow you to reference the color information later on. Keep in mind that the region and area statistic fields are not filled out at this stage... the RegionGenerator will complete the processing if you want that info as well. Definition at line 52 of file SegmentedColorGenerator.h. returns rgb struct (from colors.h) corresponding to an int index. Returns black if index is invalid. returns rgb struct (from colors.h) corresponding to a string. Returns black if index is invalid. Definition at line 54 of file SegmentedColorGenerator.h. Definition at line 55 of file SegmentedColorGenerator.h. Definition at line 56 of file SegmentedColorGenerator.h. Definition at line 10 of file SegmentedColorGenerator.cc. Definition at line 20 of file SegmentedColorGenerator.cc. Definition at line 29 of file SegmentedColorGenerator.cc. Definition at line 211 of file SegmentedColorGenerator.cc. Definition at line 203 of file SegmentedColorGenerator.cc. Definition at line 180 of file SegmentedColorGenerator.cc. Definition at line 44 of file SegmentedColorGenerator.cc. Definition at line 169 of file SegmentedColorGenerator.cc. Referenced by saveBuffer(), RegionCam::writeRegions(), and SegCam::writeRLE(). Definition at line 103 of file SegmentedColorGenerator.cc. Definition at line 65 of file SegmentedColorGenerator.h. Definition at line 95 of file SegmentedColorGenerator.h. Definition at line 92 of file SegmentedColorGenerator.h. Definition at line 86 of file SegmentedColorGenerator.h. Referenced by ProjectInterface::defLookupColorIndexByRgb(), and getColorRGB(). Definition at line 119 of file SegmentedColorGenerator.h. Definition at line 114 of file SegmentedColorGenerator.h. Definition at line 109 of file SegmentedColorGenerator.h. Definition at line 104 of file SegmentedColorGenerator.h. Referenced by ProjectInterface::defLookupColorName(), getColorIndex(), and getColorRGB(). Definition at line 83 of file SegmentedColorGenerator.h. 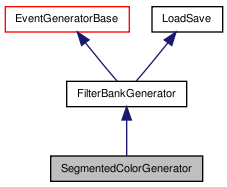 Definition at line 80 of file SegmentedColorGenerator.h. Referenced by doEvent(), getColorName(), and getColorRGB(). Definition at line 77 of file SegmentedColorGenerator.h. Referenced by DualCoding::MapBuilderRequest::addAllMinBlobAreas(), DualCoding::MapBuilderRequest::allColors(), doEvent(), and getColorIndex(). Definition at line 111 of file SegmentedColorGenerator.cc. Definition at line 78 of file SegmentedColorGenerator.cc. Definition at line 56 of file SegmentedColorGenerator.cc. Definition at line 139 of file SegmentedColorGenerator.cc. Definition at line 191 of file SegmentedColorGenerator.cc. Definition at line 198 of file SegmentedColorGenerator.cc. Referenced by loadThresholdMap(), and SegmentedColorGenerator(). Definition at line 139 of file SegmentedColorGenerator.h. Referenced by calcImage(), and loadThresholdMap(). Definition at line 140 of file SegmentedColorGenerator.h. Definition at line 138 of file SegmentedColorGenerator.h. Definition at line 162 of file SegmentedColorGenerator.h. Referenced by doEvent(), getColorIndex(), loadColorInfo(), and ~SegmentedColorGenerator(). Definition at line 161 of file SegmentedColorGenerator.h. Referenced by decodeColorsInc(), encodeColorsInc(), getColors(), and loadColorInfo(). Definition at line 144 of file SegmentedColorGenerator.h. Definition at line 142 of file SegmentedColorGenerator.h. Referenced by loadColorInfo(), and loadThresholdMap(). Definition at line 143 of file SegmentedColorGenerator.h. Definition at line 141 of file SegmentedColorGenerator.h. Definition at line 160 of file SegmentedColorGenerator.h. Referenced by decodeColorsInc(), encodeColorsInc(), getColorName(), getColorRGB(), getNumColors(), loadColorInfo(), and loadThresholdMap(). Definition at line 154 of file SegmentedColorGenerator.h. Definition at line 155 of file SegmentedColorGenerator.h. Definition at line 153 of file SegmentedColorGenerator.h. Definition at line 158 of file SegmentedColorGenerator.h. Definition at line 157 of file SegmentedColorGenerator.h. Referenced by calcImage(), loadColorInfo(), loadThresholdMap(), setNumImages(), and ~SegmentedColorGenerator().